November is the kind of month where I never know how to dress my kids. Often too warm for a coat but too cool for just a sweater, I find that I spend most of the month with a bag full of sweaters, coats, hats and mittens just in case. So when I saw this idea for a Warm Hands Sweater on the blog Elsie Marley who saw it on the site Oeuf (I always want to give full credit to my inspirations) I thought it was the perfect answer to my November clothing dilemma. Not to mention so cute! I found this striped cardigan at a thrift store, then used some scraps of felted sweaters I had left over from our Felted Sweater Mittens, for the pockets. I started by tracing our mitten templates onto a one of the felted sweater scraps and cutting them out. 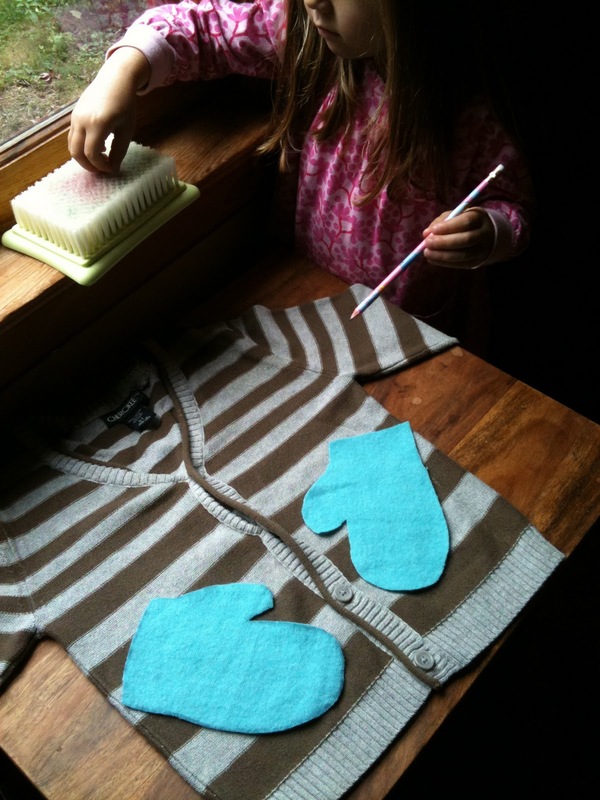 If you don't have mitten templates check our post on Felted Sweater Mittens to see how to make them. 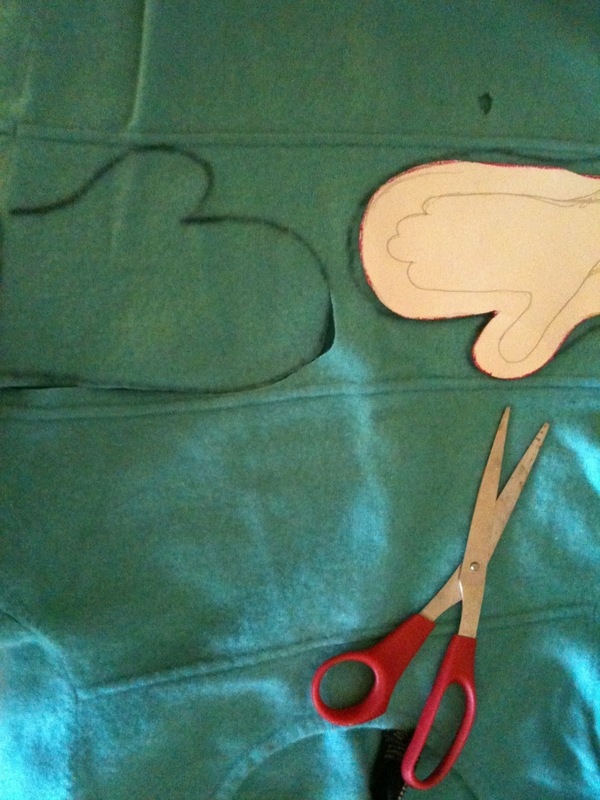 I then placed the mitten cutouts onto the sweater to get the right placement. Next I used a felting needle to tack them down in place. If I had been using a wool or even partially wool sweater I could have just needle felted the mittens onto the sweater and been done with it. However the striped cardigan I selected was 100% cotton so the needle felting just tacked them in place, you could also just pin or glue them into place. 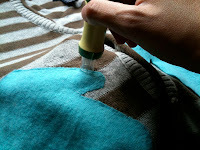 Once they were tacked down, I quickly stitched them on, using a back stitch all around the border. The Bee has already worn this sweater, frequently sticking her hands in the mitten pockets, to keep them warm while looking cool! I love, love, love this. How cozy...and cute is that! It looks like a sit-down-and-finish-in-one-session-project too. Those are the kind I love best (because I know they will get finished)!